At Inspurate we have a leaning towards social good causes. When Child Life Foundation first approached us to help them fix and streamline their digital presence, we jumped at the opportunity. The inherent mission of Child Life Foundation resonated strongly with us which is to provide quality and affordable healthcare to underprivileged children in urban areas of Karachi. What we did for Child Life Foundation was to streamline there entire content development and dissemination process, built a website that’s user friendly allowing donors and supporters to easily browse through information, request more information and make monetary donations via the several payment channels available in the United States and Pakistan, to supporting their Digital Media campaign on Facebook and Twitter. 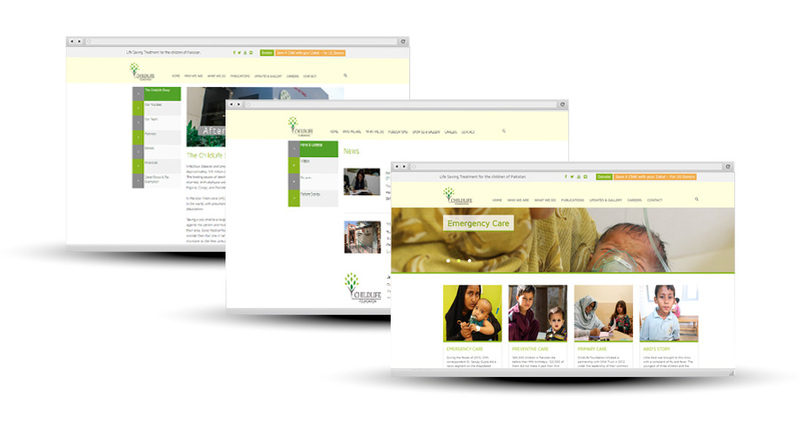 The website was custom designed exclusive to Child Life Foundations brand. It was built on the robust and mobile responsive PHP/MySQL WordPress core software engine, while relying on several APIs, such as YouTube, Habib Bank Ltd, etc.